Stucco and Dryvit walls are relatively low maintenance, offering a durable finish to exterior walls. Both products, though resilient, may sustain hairline cracks under certain conditions. Homeowners who know how to prevent hairline cracks from occurring and how to repair cracks that have already occurred, are in the best position to keep stucco and Dryvit walls looking beautiful for many years to come. Hairline cracks may be caused by underlying structural problems. 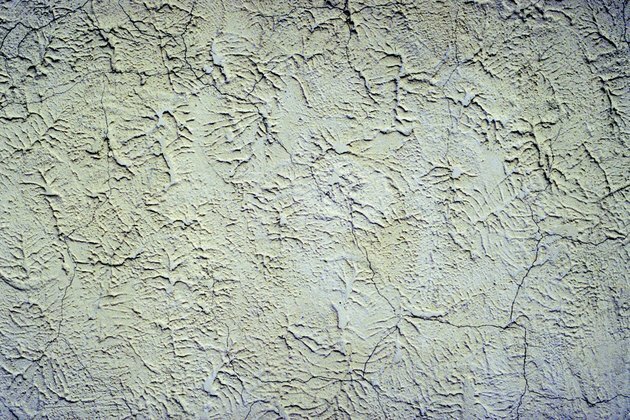 Stucco is a type of cement plaster that can be on interior or exterior walls. Dryvit walls, also known as EIFS or exterior insulation and finish system, provide additional insulation to exterior walls with an appearance that is very similar to stucco. Both materials can be applied directly to masonry, concrete or metal lath. Both types of materials can be used to transform the exterior of a home or building, and both come in a variety of styles and colors. Cracking in stucco or Dryvit walls happens when there is more stress placed on the wall than the material can withstand. The underlying cause of the hairline wall crack may be due to problems with the wall's framing, contraction or expansion of wood sheathing, settling, thermal expansion or contraction, rapid changes in temperature, weak areas in the wall or abnormal vibrations in the ground. One of the most common types of cracks is caused by the shrinkage that stucco undergoes while it hardens after application. Map cracking -- cracking that appears similar to lines on a roadmap -- is usually caused by unstable sheathing that caused movement beneath the stucco membrane. Structural cracking is generally larger, open cracks rather than hairline cracks; however, these cracks may initially present as small, hairline cracks. Scrub the area with a solution of 1 cup of household bleach, 1 cup of TSP and 1 gallon of warm water -- or power wash the wall at 1000 psi to remove mildew, dirt or any other residues that can keep the repaired area from curing properly. Repair cracks in smooth to medium-textured finish stucco by applying a fog coat of the same material. A fog coat is a lightly tinted coat of stucco that matches the same existing color to enhance uniformity. Another potential solution that works for all finishes is to use vapor permeable acrylic elastomeric paint in a compatible color to paint over the cracked area. Repair Dryvit walls with a Dryvit Rapid Patch. To apply the patch, cut through the wall's lamina to expose a uniformly-sized area of insulation that is a bit larger than the cracked area. Sand the area with a belt sander to remove the finish before removing any damaged foam. Mix Dryvit's Rapid Patch, applying it with a trowel. It should be applied 1/8-inch below the existing base coat with a thin layer surrounding the patch area. Cut mesh to the size of the area, placing it over the Rapid Patch before adding another coat of the Rapid Patch to cover the mesh and completely cover the damaged area. Smooth the surfaces once the patching material is stiff.